A Bible school for men has been operating in this area of north India since 1987. Many of the alumni have gone into rural villages to seek to bring about life change. As they have gone out, many tribal and Santal people have come to faith and they present unique challenges. Because they are uneducated and poor they find themselves stigmatized and oppressed. The alumni found many young women were not educated and wondered if there was something that could be done for these women. Women in these cultures get very few breaks in life, or for that matter, breaks in a day. They are born to work and are all their lives dependent on men. Their identity is always related to a man. As girls they are treated as a burden and they are traded out of the family as soon as possible to save costs. Sometimes as young as 11 or 12 they are married for that purpose. If they can contribute to the family income then everything changes! Santhosh and Rinu Thomas were burdened to do something for these ladies. It was decided that the purpose of the women's training would be different from the men's so rather than add women to the men's courses at the Bible school the decision was made to develop a new facility. They started thinking about this in 2009 and began to prepare. The first course was held in 2014. The women's interest is first to learn the Bible but they come with many issues. Some struggle to read. Many are filthy and have not been clean once in their life. They are taught the Bible and various other things to help with cottage industry to improve their livelihood. A Mission has been on the ground in this area for well over 100 years. Missionaries from the UK served here for many years until the 1950's. Santhosh shifted to this area in 2000 and Rinu joined him after their marriage in 2002. They arrived to take over from a resident missionary who was due to retire. They began to develop a school which now has over 1,000 children and the Bible training institute. In 2013 a man who is the son of a New Zealand missionary and who was born in India talked to BHW about the development of the women's ministry here and their need for help to build a building. We were unable to assist at that stage but three of BHW's leadership team met Santhosh at IBCM in Rome in mid-2015. Later that year BHW's Field Director visited them in India for three days and was impressed with the vision and the strategies they were developing. We continued the dialogue and BHW's Field Director visited again in July 2016. It was following this visit that a decision was made to commence partnering with Santhosh and Rinu. The immediate beneficiaries are the girls who come from all over north India. Some are tribal, some Santal, Bengali and from Bihar and Assam. The majority are from Hindu backgrounds and although their parents are concerned about where they are going and what they will be taught, after coming to visit their fears disappear. The women are as young as 15 and up to late 30's. Santhosh and Rinu are good people with vision, passion and a great track record. The women and girls they are training are as vulnerable as any you will find in this part of the world. There is a strong emphasis on the Bible as well as practical skills. There is a strong, established organisational structure around it. Santhosh and Rinu are from Kerala although Rinu was educated in Muscat and graduated with a B.Com from Muscat University. She came to this area after their marriage in 2002. In 2002 they attended the Haggai Institute in Muscat together. Rinu has worked all her life in the women's ministry of churches and has had training as a children's worker, also doing CEF training. She visits around local churches talking to women and speaks at women's conferences. She is currently studying her Masters in Biblical Studies as well as being a mother to their three children, Gaius (born 2003), Rufus (born 2006) and Charis (born 2009). Santhosh is in overall charge of the mission facility and programmes so is involved in this but he is hands off in terms of the running of the programme. Anima Nirmala Dungdung comes in to lead the work on a day to day basis. She is single and lives in the Bhutan border area with her brother, his wife and their mother when she is not at the school. She is very organized and good at translating and teaching. She has a Bachelor of Religious Studies from a Baptist Bible College in Bangalore. Working with her is Suchitra Das who was a student with the last batch of 2015 students. When Rinu came here in 2002 she was immediately shocked by the condition of many of the women, especially the young girls who were married off. 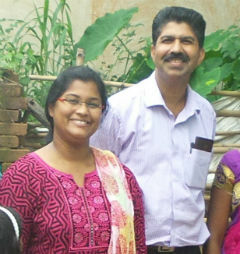 She fostered a dream to do something for them and Santhosh caught the vision as well. Their vision is to see young women given a chance to grow up before they get married, to prepare them for marriage and to help them gain some degree of dignity. In 2003 the Bible school began camps for women and started with 15 girls for 10 days. Over time this grew to 100 girls. At the end of the camps the girls did not want to return home. They had never experienced this kind of love, care and friendship. However, the mixture of Bible and vocational training was difficult to achieve in a short camp. They realized that a camp was like feeding someone but to teach them to fish something else would have to be put in place. This current empowerment programme includes Bible teaching as well as sewing, knitting, detergent making, candle making, hygiene and health. The first two courses have been completed with 20 women in each. They were for four months but this was not long enough so in September 2016 the first six-month course will commence. They intend to also run free tuition for the community women, especially in sewing. This will be done in the six months that the girls are not in residence. They are keen to do this to build relationships with the community and local women are clamouring to be allowed to participate. The budget for the first year is US$5,500. This will enable them to purchase 10 treadle sewing machines for the sewing course, buy sewing machines to give the graduates and also cover some of the general operating expenses of the empowerment courses. I met three young women, one was from the first course and the others from the second course. They were very shy, not used to talking to a man, let alone a white one! They told stories about how they now know a lot more about the Bible and about how to live as a Christian woman in the village. The people in the village have been shocked at the change they have observed in them and at the new things they are saying and doing. Rinu was with me as I talked to them and found that one was 25 and not married, one was 20 and not married and the 18-year-old was engaged but the parents were putting no pressure on her to leave the home. Rinu was very surprised at these comments.